Screwing around doing the Angelo Bronte glitch, I went to the post office to pay off my bounty. I was surprised to see that West Elizabeth and New Austin are not on the list of states in this mission. I only have the option to pay my bounty off in Lemoyne, Ambarino and New Hanover. This glitch is curious. Makes me think whoever thought this was a leftover backdoor way into New Austin might be correct. So you can go all the way to NA inside of that mission when trying to avoid the lawmen? Yes, at the part where you are supposed to return to Bronte. Robbed Herbert Moon, Tumbleweed's Gunsmith, and their General Store. There was no law in Tumbleweed also, I had to shoot some guys to get them to show up. I also could not use the saloon, the bartender only had the option to greet him. Really the weirdest part was that WE and NA didn't show up when I went to pay my bounty. They had to have coded it like that. Well that's an epic screenshot in the making if you find the right backdrop for Arthur and John! Oh damn, thats a great find. I was going to test that out myself a few weeks ago, but never gotten to it. Screens of Arthur and John in NA now!!!! Good thing i have a save right before the mission, i'm gonna go there with my decent gear rather than on mission replay with few items, and see how it all plays out. But inside, the bar and its marble fountain are based on the Old Absinthe House ones. Damn @koeklin that's some fine detective work. More echos of cut content. The other night I noticed the Landmark icon "Fort Riggs Holding Camp". I know it's empty and must've been for something cut. Strange the icon still popped though. Getting closer to it... the icon disappeared from the mini-map. Also there's this weird disconnect between where the Stranger Mission for writer Evelyn Miller is supposed to be. He's holed up in the old Tanner's Reach cabin, yet the map notes his camp out in the wilderness. Sure enough, there's a unique campsite there. I don't think it's the same campsite as the hunters he harrasses. If it is, a lot of the Hunter content was removed leaving this one campsite with his name on it. Lastly... the Official Guide says there's "A gruesome corpse pit just east of Aurora Basin". I rode around and couldn't find anything suggesting that. Lots of places the Skinner gang has appeared, but not pit o' bodies. Wouldn't that pit be the one filled with the football team? So, in the leaked version they had Mexico...maybe they have dlc plans there? I'm no expert in making games but Mexico is fully updated. That must mean something down the road. 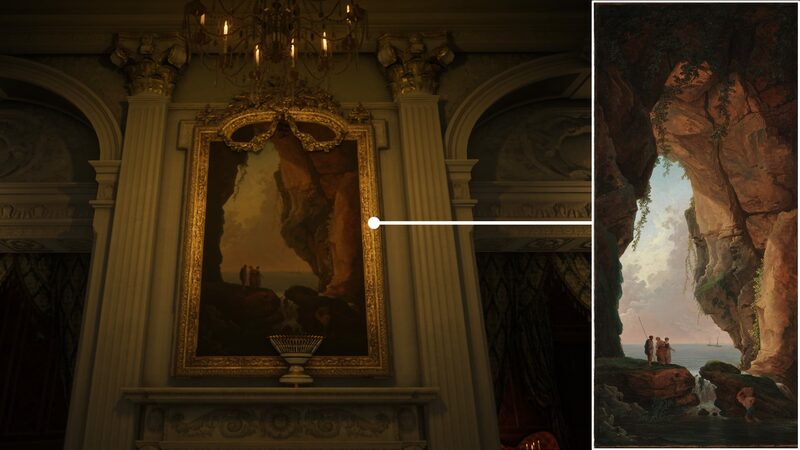 The leaked map? No, it didn't even have New Austin. Most of Nuevo Paraiso is viewable from New Austin, at least most of the unique landforms, so it's no wonder that they modeled it after Redemption with enough details when looking from the distance. Therefore, I don't think any of this indicates a plan to open up the Mexican side for exploration or a future story DLC. 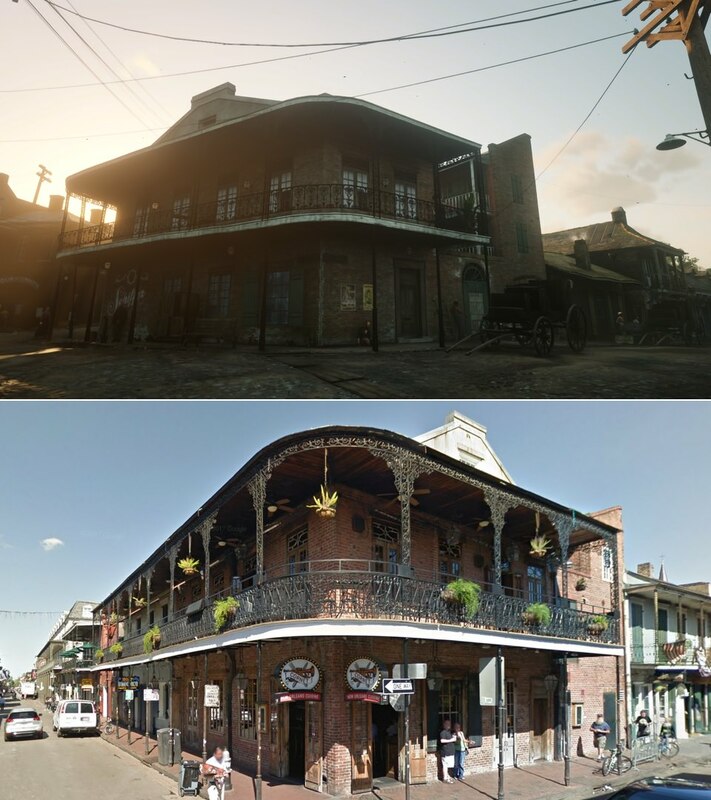 I'd personally love to visit that side with more stories to tell in the single player. No Red Dead fan would decline to experience more stories! 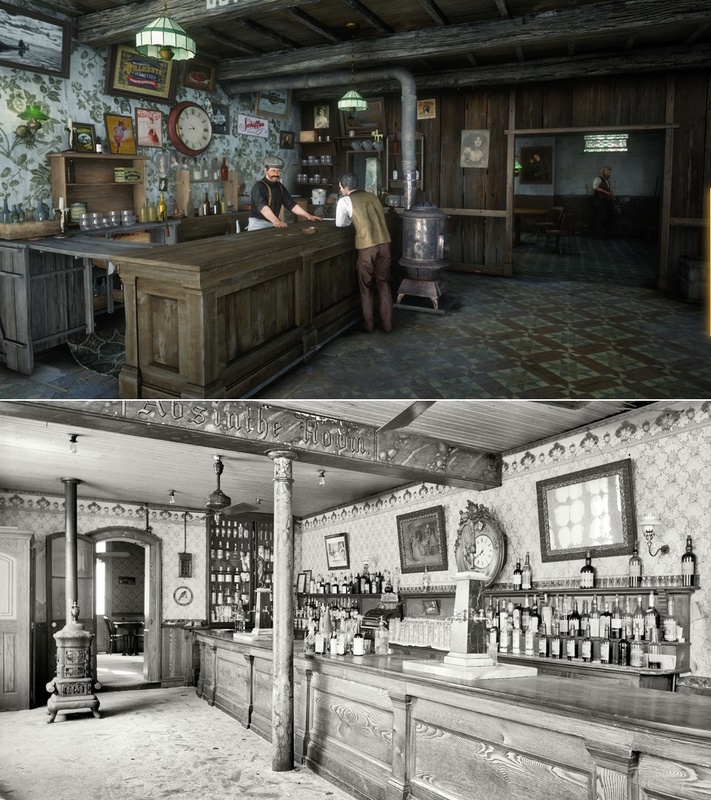 You can see the old RDR1 textures in Mexico when free roaming there. The trails are hard to spot but you can see them. I don't think they updated it that much, just enough so its not a distracting eyesore from New Austin. Did you recently have a conversation with the drunk sad guy around the camp fire (think it was somewhere near the New Hanover/Lemoyne border, down from Emerald Farm)? The one who talks a lot about sinning, and locking up Native Americans, bums a bottle of whiskey off you and then passes out? 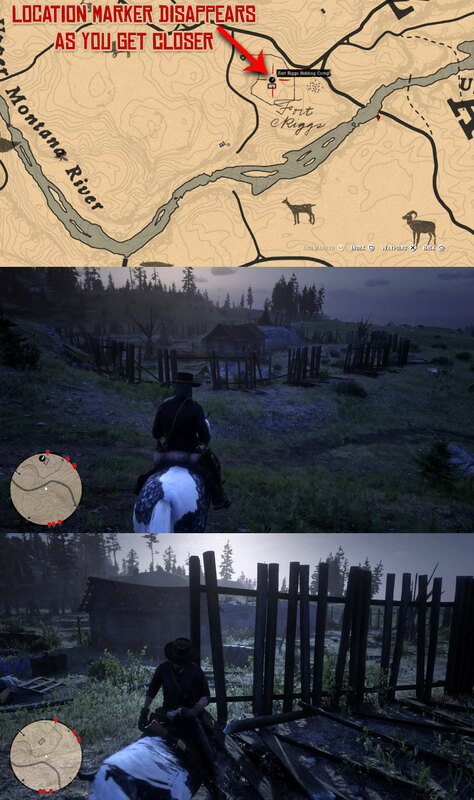 For me, the "Fort Riggs Holding Camp" icon appeared immediately after I'd had that encounter, and disappeared once I visited the site.....I had assumed it was just a way of tying in the location with his story. A bit weird that it's the only time this happens in the game, but then there aren't a whole lot of people who want to chat to you around a campfire, as opposed to starting a gunfight! -First I went to Fort Riggs on my own. Got that alphabet letter from there, I think it was. -Minutes after, I had the encounter with the Fort Riggs ex worker, by SW of Heartlands, not far from Fort Riggs itself. I was like "okay, this must be a triggered encounter". -One day, playing the Epilogue already, I saw the Fort Riggs icon. Went there, nothing. That's it. I don't debunk your theory, tho. Just sharing what happened to me. Maybe it didn't work for me because I was at the location beforehand. I don't know, this game has a lot of mystery. Yeah, I had that camp encounter several days ago, so maybe that marker was there the whole time and I didn't see it until recently? I did loot the guy to get the Indian Wedding Ring. But no, multiple posts from you, even 2 days before RDR2 launch, about how RDR map is now 200/400/over 9000% larger than in original. And that is fine, being overenthusiastic, craving impossible and all, must have been painful when reality hit hard. 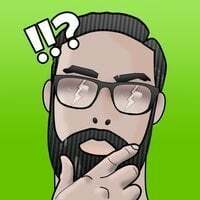 Stop misleading people into thinking Rockstar actually worked on San Fierro and Las Venturas being added to GTA V map at any point. 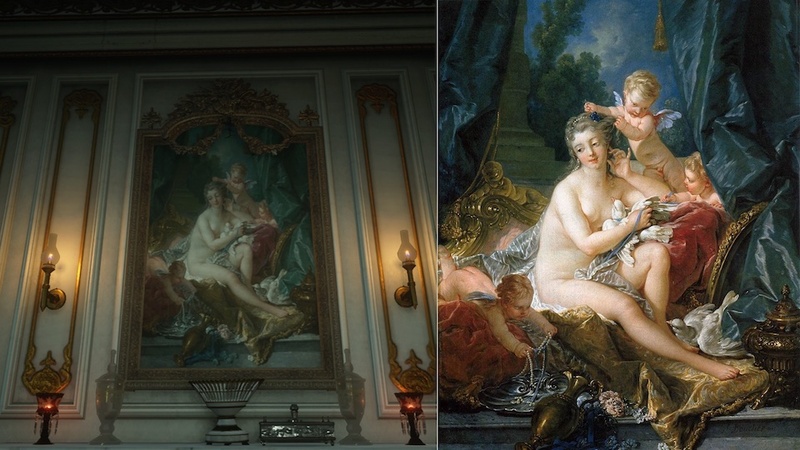 All we have is few references in-game, exactly the same as in GTA IV. PS. Sorry for OT, but it had to be said. I didn't say they worked on it at all? Yeah they originally wanted to do it bigger but for some reason (last gen console limitations most likely) they didn't. If you look into the mapping thread you can even find interviews stating this. I have never said it was in the code, but we can see some of those locations on cards and billboards. 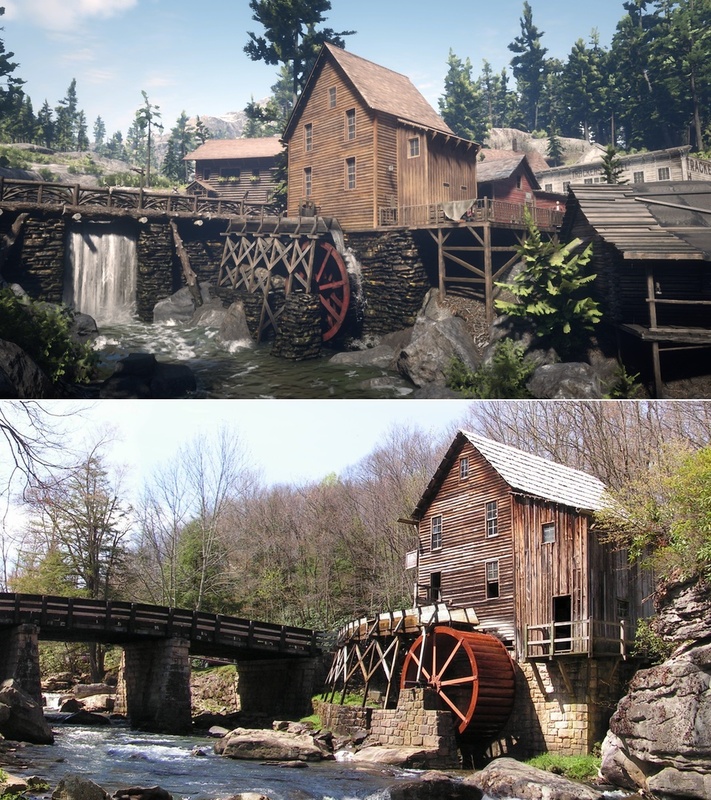 These show unused towns and other locations. Perhaps you don't call that cut content, but I do. I only piled up all the evidence we found (not just me but about a dozen others) and put it together in a neat document. 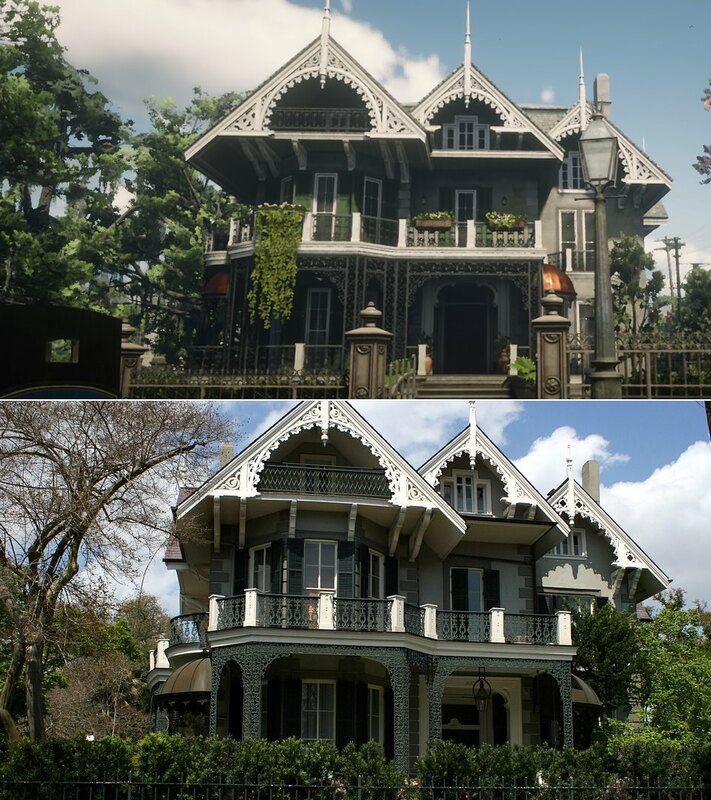 About the scale increase, yes I was wrong, although we didn't know the map was changed so drastically in height and R* used a lot of specific camera angles. And I never said 9000% larger I said 2x and that's it. And why did I say that? Because it looked that way. Not just me but loads of others thought it as well. 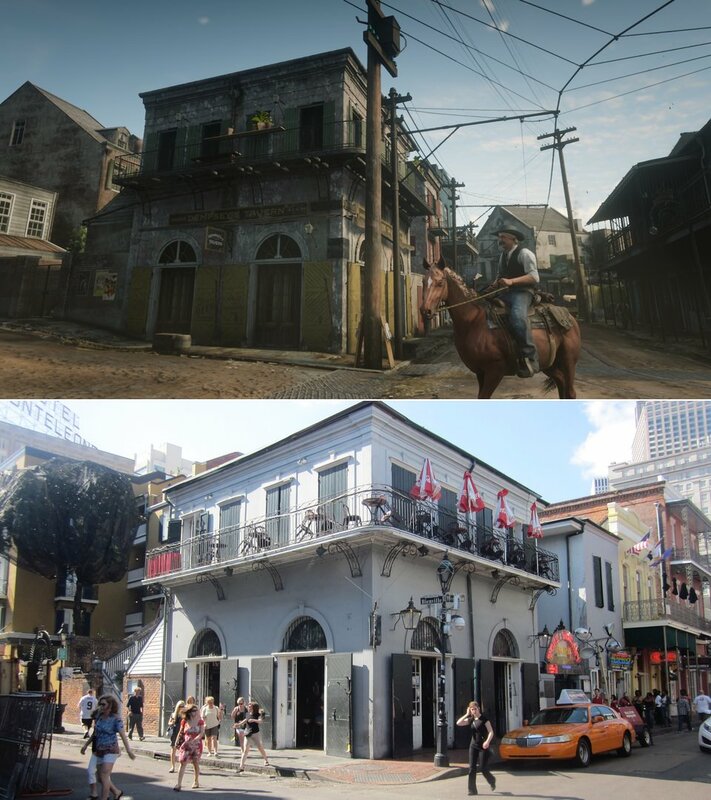 In the end I was right about the map being (non scaled) about 3/4x the size of rdr1, but little did we know only 1/3rd is accessible. Also I always made claims with reservation, not just out if nowhere. Btw, speculation is a healthy thing. Especially when said speculation is substantiated with evidence. That you are one of the few who doesn't like it, tells us more about you than us. 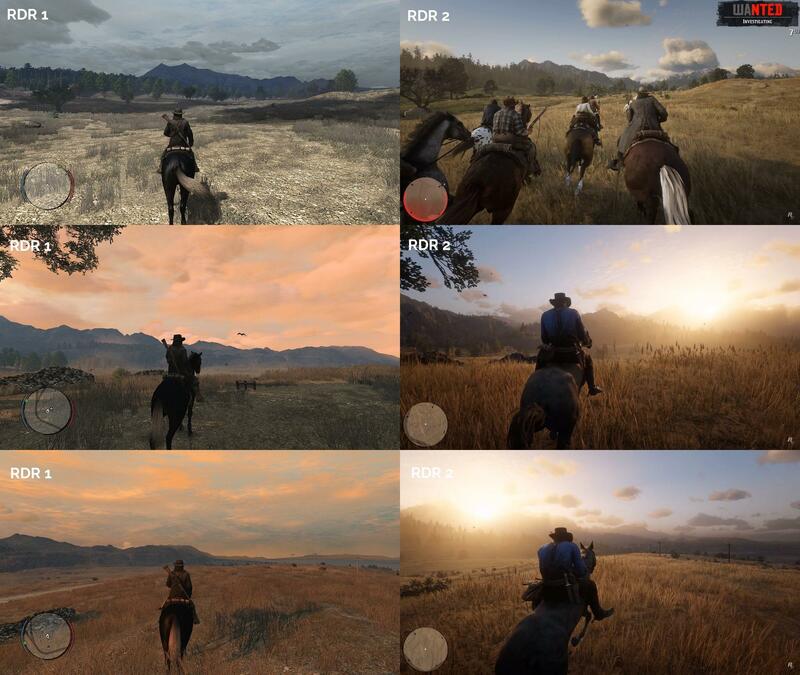 In the end we got a map of the same scale, although changed greatly in comparison with rdr1 and much better draw distance (the reason some of us, including me, got confused). The current map is surrounded by valleys, canyons, mountains, plains and deserts. 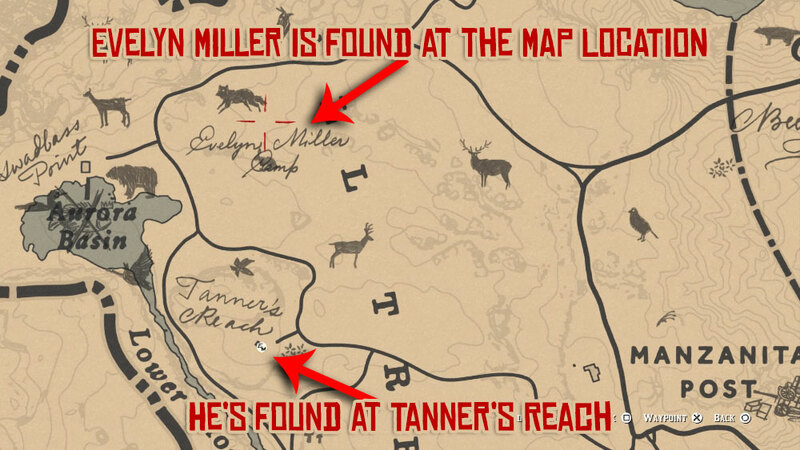 These make the map much much larger than GTA V, which we did claim. Yeah it sparks the talk about possible map expansions. You don't like that? F*ck off then. The rest of us loves it and enjoys it. Don't bother us with your whiney sh*t, we enjoy exploring the regions outside the map boundaries, which to me also count towards the map size ;). This is kind of map related, since it happens only when in sisika pen, in the cellar/basement level of the central tower. So you guys think it’s a glitch or something that has to do simply with the lighting or something? Or could this actually be something? Something similar happened when i found that huge cuboid in the jungle of Guarma, and walked under it. I think it's probably just a lighting error. Where we arent meant to be down there so no lighting properties have been implimented there. But my god it does turn the character undead lol! Havent tested that out myself but i did go into Sisika with negative honor. That invisible sniper gives you no quarter. Ended up reloading my game on the San Luis River at a campsite, quickly went to sleep until night, and I got killed on the loading screen. Crap. Didn't even let me wake up first.